In one of the most cynical stunts ever, Christy Clark offered up a throne speech that mirrored much of what the NDP and Green Party had campaigned on. Oh, it wasn't because the BC Liberals had a change of heart, it was because they needed to pull at least one opposition vote away from the NDP/Green side to pass their throne speech and grant 'confidence' to the house. There was never any intention to follow through with any of their ideas outlined in their 'come-to-Jesus' throne speech. This is proven since from all the pro-BC Liberal trolls and insiders attacking the NDP/Greens for following through with campaign pledges that the BC Liberals had magically endorsed from their cynical throne speech. If their thoughts were genuine, at a minimum they'd be neutral, at best they'd be supportive. But, no. Just a hypocritical attack from the BC Liberal bench on ideas from the NDP/Green that Clark's converts once-upon-a-time would have done themselves. 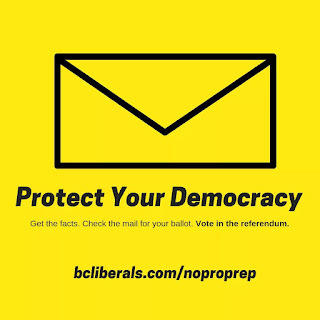 Upon their defeat in a non-confidence motion and as a last measure of ultra-partisanship and not reading the message from voters, the BC Liberal Speaker also resigned instead of remaining as an officer of the Legislature. Voters told politicians that they wanted more collaboration. Before getting into politics, Daryl Plecas had a whole career in the justice system. There is an element of this outside experience that lends a hand to refereeing a house full of cantankerous politicians. His decision to become Speaker upsets many in the party and I understand that, but the venom and temper tantrums since are a special level of entitlement, denied. What ices this for many is that after this decision was made, as if to spite the man, the party revokes his membership in the party. I've never seen that before. Not for this sort of offence at least. Its tradition to leave caucus once elected as speaker, so as to give an appearance of non-partisanship. But expulsion? That's cold. Apparently, the crime of making government function in a parliament where voters told politicians to work together, is a crime. So be it. Given the failure of the BC Liberals to 'hear' what voters were telling them, they will be lucky to only have one MLA leave their ranks. If I was a betting man, I would wager a small sum that we haven't seen the last seismic activity in the back benches of the BC Liberal party. In fact, I'd expect it. This is entirely a self inflicted wound.